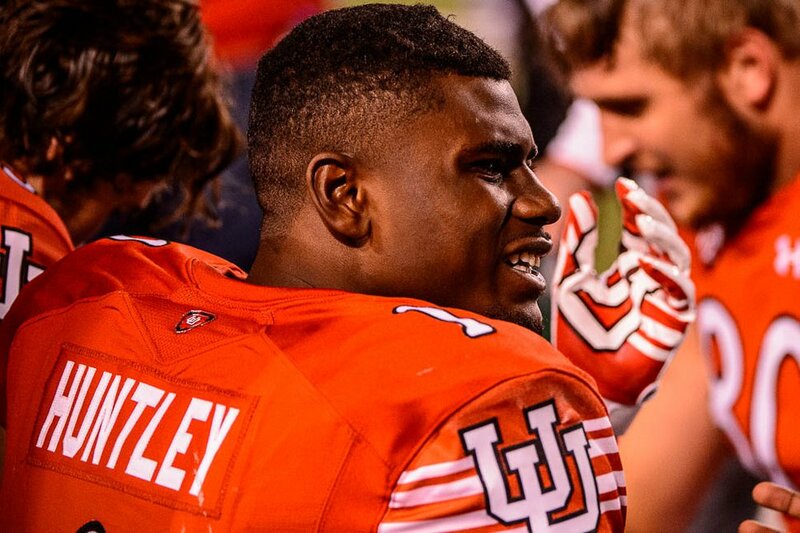 ‘Football is football,’ Ute quarterback Tyler Huntley says. ( ) Waldorf University receiver Samuel Huntley turns upfield after making a catch vs. Dakota State in Forest City, Iowa. 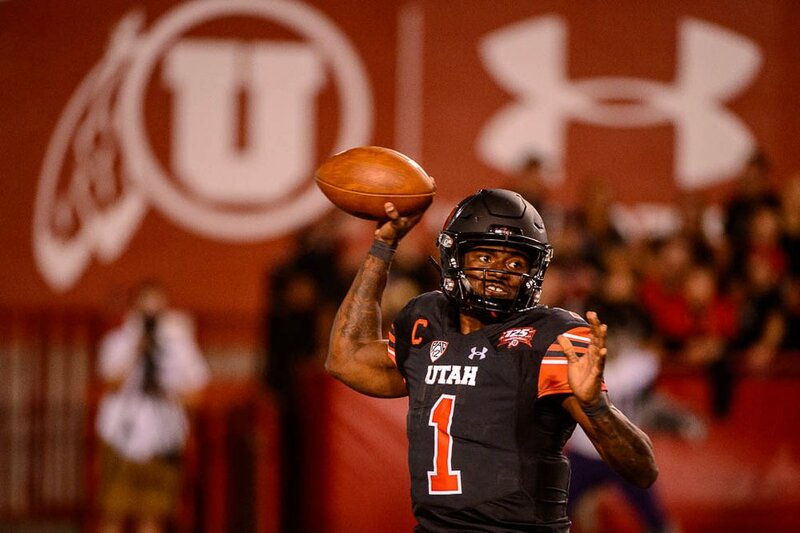 Hours before Utah quarterback Tyler Huntley rolled out to his right and tossed his fourth touchdown pass of the night vs. USC in front of 46,000-plus fans in a sold-out Rice-Eccles Stadium, his brother made a touchdown reception that gave his team a lead over Presentation College. How many fans cheered Samuel Huntley's catch in Iowa? Two hundred and twelve. The Huntleys will play college football again this weekend in contrasting venues. Tyler will quarterback No. 23 Utah vs. UCLA in the famed Rose Bowl; Samuel will join his Waldorf University teammates at Dakota State's Trojan Field in Madison, S.D. The Waldorf Warriors, competing in the North Star Athletic Association at the NAIA level, play on a campus of 2,200 students at a liberal arts school with Lutheran roots in a town of about 4,000 residents. Forest City, just off Interstate 35, is known as the Winnebago manufacturing headquarters and for being about 120 miles equidistant from Des Moines, Iowa, and Minneapolis. The lifestyle is described as a classic, country existence amid the cornfields, with the nearest semi-big town (Mason City) located 30 miles away. The second and third sons of Ricky and Regina Huntley are living in vastly different places, performing in varying strata of collegiate athletics. Yet they have much in common. Each wears No. 1 and produced the best game of his college career Saturday. Tyler passed for 341 yards in a 41-28 win over USC; Samuel caught eight passes for 85 yards in a 44-38 loss to Presentation. A multisport athlete and musician, Samuel Huntley is 18 months older than his brother. In elementary school, their parents chose to place him in the same grade as Tyler. The brothers played on different youth teams, though, and got together only in their senior year of high school football. Hallandale was loaded with future FBS receivers. Samuel earned considerable playing time, once catching two touchdown passes from his brother in a game. In February 2016, when Tyler Huntley and Simpkins already were enrolled at Utah after graduating early, Moss and Samuel Huntley were among 20 Hallandale players who signed with four-year schools. Five of those Chargers chose Waldorf (NAIA schools can offer athletic scholarships), where the program’s previous coaching staff had a Florida connection. The current staff maintained that pipeline, having established a good reputation. The Warriors' 2018 roster includes 30 players from Florida, including a Hallandale Foursome — topping Utah’s Hallandale Trio. Told about the school’s Florida imports, a Waldorf soccer alumnus from Midvale audibly shuddered, remembering a morning when the nearby Subway marquee read minus-20 degrees and walking 75 yards from a dorm to a classroom building was daunting. Even in early October, Samuel Huntley was mentioning the weather in a call home. Crowd size varies for the brothers, and so does their levels of media interaction. Over the past month, Samuel Huntley did not respond to multiple requests regarding this story. His brother regularly does interviews, although sometimes reluctantly. Utah coach Kyle Whittingham always has required his starting quarterback to attend Monday news conferences during the season. Tyler Huntley cooperates, but he’s eager to exit as soon as possible. That’s just part of the job for Huntley, whose most memorable quote in two seasons came after a win at then-No. 14 Stanford in early October. He didn’t even sit down before defiantly asking reporters what they thought about his receivers — having heard all of the criticism of them in September. On the field, Huntley is having a fabulous October. In three Pac-12 wins, he has completed 76 percent of his passes for 741 yards and seven touchdowns, plus two scores by rushing and one by receiving. He even catches touchdown passes. So does his older brother, only on a much different stage. Level of football: NCAA Power Five. Team record: 5-2 (3-2 Pac-12). School: Waldorf; Forest City, Iowa.